This book is the diary of Dabbous’ imprisonment, but it is also a tribute to the people of Syria, who have never given up hope despite the horror that surrounds them. 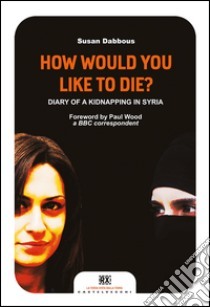 On April 3, 2013, Susan Dabbous, a Syrian-born journalist, was kidnapped along with three other Italian reporters in the Christian village of Ghassanieh, Syria by Jabhat al-Nusra, a branch of al-Qaeda. They were captured in front of a desecrated church where they were shooting a documentary for RAI TV. After being taken to a prison-house, Dabbous was subsequently separated from her colleagues and moved to a flat with Miriam, the wife of one of the jihadi, who was to be her new prison warden. It was up to Miriam to see to Dabbous’ “Islamicisation”, and with her, she prayed and listened to speeches given by Osama bin Laden. It was also with Miriam that Dabbous was made to reflect upon a question asked of her during her imprisonment, “What is you favourite way to die?” Dabbous’ answer to this question was sincere, “because when you are a hostage you do not lie. So I spoke to her woman-to-woman, using a language that was mainly made up of emotions.” After eleven days, they were set free after an agreement was reached with the Italian secret service. After a brief stay in Italy, Susan set off again for Lebanon, where she has been living for more than a year. It was during this time in Lebanon that she discovered that her friend in the village of Atme, Syria had been tortured solely to extract information about her.